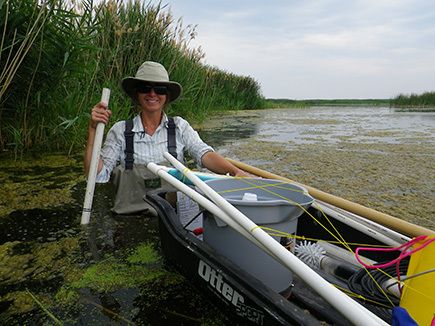 To use the Search option, simply click on the left pane and type in the Stream Name, Assessment Unit ID, Unit ID, or location coordinates of the waterbody of interest. Hit “Enter.” Your selection will be highlighted on the map. If more than one waterbody contains all or part of the same stream name, a drop down list allows you to select the name that best matches your search. 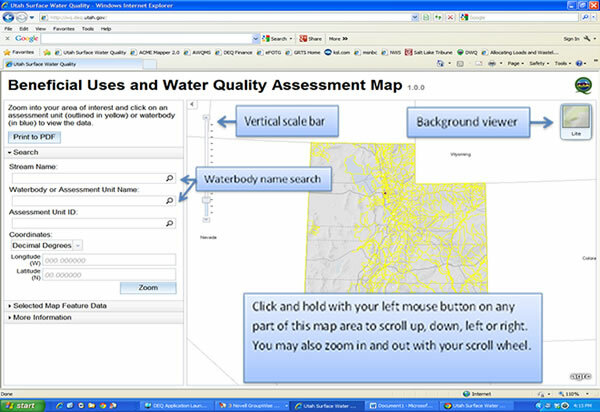 To use the Navigation feature, select an Assessment Unit or waterbody using the vertical scale bar on the upper left side of the map. This bar lets you zoom in or out. As you zoom in, map elements and waterbody names will appear. DWQ assessment (waterbody) boundaries and names appear in yellow. Click on any part of the map and hold down your left mouse button to scroll up, down, left or right. You can also zoom in or out using the mouse scroll wheel. By clicking on the small box located in the upper right hand corner, you can select different map backgrounds, such a topographic or terrain. Once you find your area of interest, you can select an Assessment Unit or individual waterbody by clicking on it once. The outline of the area you select will turn light blue and detailed information will appear in the left window pane under “Selected Map Feature Data.” If the waterbody is impaired (as indicated in the “2010 Assessment” data field) and water quality restoration plans have been approved, the “TMDL Information” field and Web link will appear, allowing you to view the plan to restore the waterbody to its designated beneficial use. You can print the current map view and information from the left window pane using the “Print to PDF” button. The map includes contact information for the watershed scientist assigned to the waterbody if you have questions or need further assistance. Disclaimer: The information provided on this Web page is not the official record of impaired waters. Please see the Water Quality Assessment Program page for details.